Performing in more than 85 rodeos each year, the All American Cowgirl Chicks® is a self-funded rodeo entertainment team who relies on sponsorships to offset costs associated with traveling, cowgirl camp, and horse expenses. At the opening of each rodeo, the Chicks ride to pay tribute to friends and family members whose lives have been touched by cancer. The Chicks also ride in memory and honor of the brave men and women in uniform by carrying a military flag from each of the branches of the military. Your contribution not only supports our team but also for the different causes and charities that we ride for. Donations in any amount no matter how big or small are greatly appreciated. When you make a donation, your name will appear in our Cowgirl Friends Hall of Fame page on our website. We are touched by your generosity. Thank you for your support! 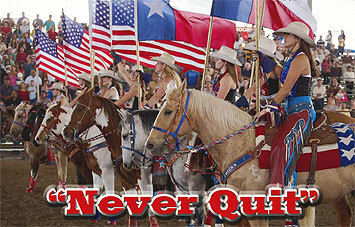 Sign up to receive Cowgirl Chicks e-newsletter!